If you are like most photogs, you have probably never even heard of this gem, much less seen it. Yet, the incredible German made Steinheil Casca II of 1948 was easily, far and away, the most advanced rangefinder camera of its time. This means it outshone some tough competition, considering Leica, Nikon, Canon, and Minolta had all started post war production by that time. Apparently Leica was impressed and took the Casca seriously. Supposedly Leica threatened to sue over claimed patent infringements, successfully stopping Casca II production after only several hundred had been sold. What was so special about the Casca II? Almost everything. 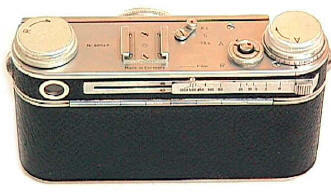 A more advanced camera would not see the light of a sales brochure until the Leica M3 of 1954. The Casca II's unique design is easy to spot. I spied this one half way across a large camera show hall. There simply isn't another camera that looks similar, except the rangefinderless Casca I. 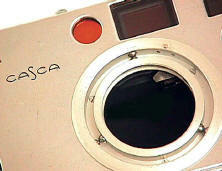 The Casca is very well finished, though it does no compare to the Leicas of the same period. 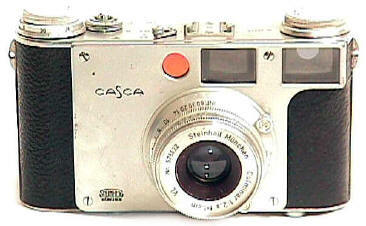 Instead of chrome, the Casca uses mostly aluminum, even on the strap lugs (which are worn through on this camera). Large viewfinder with projected 85 and 135 brightlines. Leica would not have projected brightline frames until the M3 of 1954, Nikon not until 1957 with the SP, Canon not until 1958 with the VI, Contax...never. While the large eye relief is excellent by even 1999 standards, the finder and rangefinder brightness are more like 1948 standards...not so bright. A very fast and very unusual bayonet lens mount. All you do is rotate the lens about 10 degrees and the lens come off. No pesky bayonet release to bother with. The lens mounts on three sets of ball bearings, very strange and very ingenious. 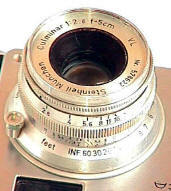 At the time when Leica and Minolta were using the traditional Leica screw mount, while Contax and Nikon used a double bayonet system, this was easily the fastest lens mount made. Super convenient film loading with flip open back. Leica would not match it until the M3. The amazing Casca shutter speed dial wasn't -- a dial. Instead it was a sliding bar which was perfectly positioned below the photog's right thumb. Shutter speeds ranged from 1/2 to 1/1000th with B. You chose the 85 or 135 bright framelines with the lever on top of the camera. The 50 had no brightline. Still, the world would have to wait for the M3 for a projected brightline finder to appear once again. The brightlines were not parallax corrected. Alas, the Casca was advanced, but not so advanced as to have lever advance and wind. The film advance is smooth and the shutter quiet, not all that unlike a Leica IIIc. The body covering is well done, similar to the IIIc's vulcanite. 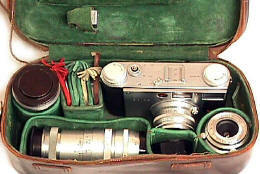 Film rewinding is accomplished by the rotating collar around the shutter release and the large rewind knob. The sliding catch from A to Z opened the back. The flash sync was manually set, and fully adjustable to most popular bulb choices, including electronic flash. Some sort of two prong flash cord connection fitted to the bottom plate was required. The Casca's amazing bayonet mounts with only a twist of about 5 degrees! The bayonet lens mount mates with three sets of ball bearings in the body mount. Notice the round indents on the outside edge of the lens bayonet (they are above and to the left of the round holes in the bayonet). As the lens is inserted into the body mount, the round ball bearings align themselves with the round indents in the lens bayonet mount. Pushing the lens further seats the ball bearings in the bearing channel of the lens mount. Twisting the lens mount only a few degrees seats the ball bearings in or out of the bayonet mount. Twist the lens towards the film advance knob about 5 degrees to remove the lens. 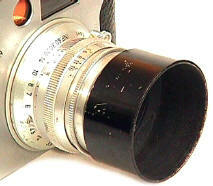 To mount a lens, first focus it to infinity and align the top center of the lens with the top center of the lens mount. Insert the lens into the mount and twist it about 5 degrees towards the film rewind knob -- until you feel the lens lock. The three opposing sets of ball bearings are spring loaded on each side, so they can spread apart for the lens bayonet. The middle pic shows both the inner and outer curled "C" springs which hold the ball bearings in place. The last pic shows the Casca II with the lens mount removed. Left to right: 35/4.5 Steinheil Orthostigmat , 50/2.8 Steinheil Culminar, 85/2.8 Steinheil Culminar, 135/4.5 Steinheil Culminar. I'm told a 50/2 Quinon was also made in Casca mount. All shared the 40.5 filter size. The lenses of this set are marked "Made in Germany," except the 35 which is marked "Made in Germany US-Zone." The 35 finder is also marked "Made in Germany US-Zone." The 35 and 50 focus to just under 3 feet, the 85 just under 3.3 feet, the 135 just under 5 feet. 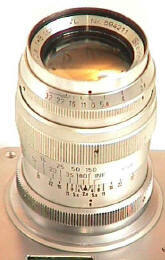 Not content with the single focusing lever used on Leica wides and normals of the period, Steinheil did Leica one better with TWO focusing levers. Gee, what will they think of next? Strangely enough, the 35 and 50 rotate counter clockwise to infinity, the 85 and 135 rotate clockwise to infinity. Hmm. Maybe the Casca is a Gemini. 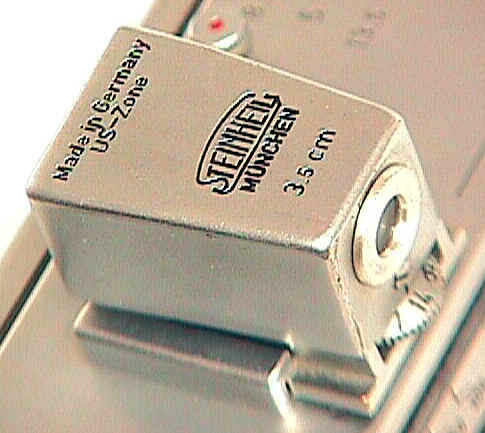 The "Made in Germany US-Zone" 35mm Steinheil finder was apparently marketed separately, since I have seen about six of them without an accompanying Casca. 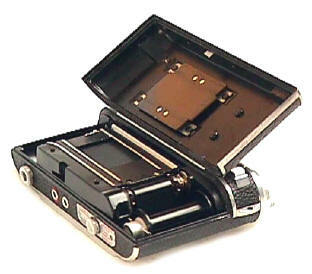 Not content with Leica or Contax style loading, Casca had its own very easy and unusual back flip film loading design. The film spool is removable. The film The back flips UP and out of the way to show the Leica like cloth shutter. The 50mm lens shade also does the job for the 90 and 135. Only "Casca" filters would be good enough for Steinheil's post war wonder. All Casca lenses used the same 40.5 mm filter size. 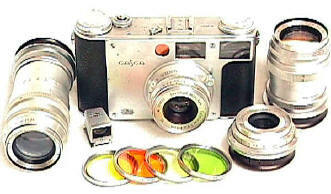 Included in the Casca kit were Yellow, Orange, Green, and UV filters. The unmarked Casca rear lens caps are rather strange things. I wonder how many have been thrown out because they were not recognized. The Casca zippered wasted no space in fitting the Casca body, four lenses, four filters, shade, and 35mm finder.
" It does need to be recognized that so many things in Europe of 1948 were scarce, rationed, or simply unobtainable. This may have had a hand in the camera's early demise. My guess is that this camera proved to be too expensive to produce, particularly at a time when German industry was just struggling to restart after the war. The machining is of Leica level and most of the materials are excellent. The method of lens mounting and interchange is utterly unique in my experience. Three sets of opposing spring loaded ball bearings part as the lens is inserted, dropping into detents machined into the lens flange throat -- thereby locking the lens securely. Lens removal or mounting requires only that the lens barrel be turned about 10 degrees! Many of the service adjustments are well and uniquely hidden. One of the few shortcoming to an excellent design are the strap lugs, cast into the light alloy body. The lugs are thin and weak to begin with -- they can easily wear through. No design allowance for wear or repair is provided. " The Steinheil Casca II was far ahead of its time with features that eclipsed the competition, even if its finish did not. It deserved to be a best seller. Instead the Casca II sank into oblivion with very limited sales. Perhaps the rumor that Leica forced Steinheil to stop production due to patent infringement is true. It would not be until the Leica M3 until we would see a large finder like this one again. Revised: October 12, 2012 . Copyright � 1998-2012 Stephen Gandy. All rights reserved. This means you may NOT copy and re-use the text or the pictures in ANY other internet or printed publication of ANY kind. Information in this document is subject to change without notice. Other products and companies referred to herein are trademarks or registered trademarks of their respective companies or mark holders.